A new supercomputer simulation offers the most detailed view yet of how the first stars evolved after the Big Bang. The model follows the simpler physics that ruled the early universe to see how cold clumps of gas eventually grew into giant star embryos. "Until you put that physics in the code, you can't evaluate how the first protostars formed," said Lars Hernquist, an astrophysicist at Harvard University whose early-stars model is detailed in this week's issue of the journal Science. Mysterious "dark matter" provided the first gravitational impetus for hydrogen and helium gas to start clumping together, Hernquist said. The gas began releasing energy as it condensed, forming molecules from atoms, which further cooled the clump and allowed for even greater condensing. Unlike previous models, the latest simulation takes this cooling process of "complex radiative transfer" into account, said Nagoya University astrophysicist Naoki Yoshida, who headed up the modeling project. Eventually gravity could not condense the gas cloud any further, because the densely-packed gas exerted a pressure against further collapse. That equilibrium point marked the beginning of an embryonic star, called a protostar by astronomers. 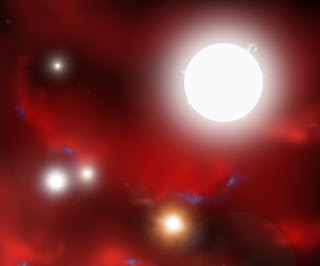 Simulation runs show that the first protostar likely started with just 1 percent the mass of our sun, but would have swelled to more than 100 solar masses in 10,000 years. "No simulation has ever gotten to the point of identifying this important stage in the birth of a star," Hernquist noted. The first protostars reached such massive size because they consisted of mainly simple elements such as hydrogen and helium. That bloated existence means the stars which eventually form from such protostars could create heavier elements such as oxygen, carbon, nitrogen and iron in their fiery furnaces. Simulating the first stars by Centauri Dreams.